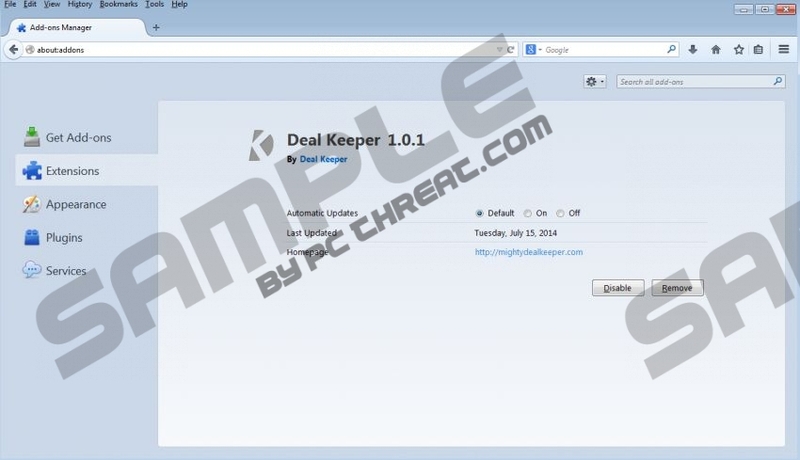 Deal Keeper is a free browser add-on which is aimed at improving your browsing experience. The program is promoted at mightyhdealkeeper.com and is compatible with Internet Explorer, Mozilla Firefox, and Google Chrome. As regards Google Chrome, it has been found that the browser add-on does not work on the latest version of this Internet browser. If you do not remember installing this browser add-on, the odds are that you have installed it as an optional program. It is very important to pay close attention to the information provided by the installation wizard so that you can prevent the installation of unwanted programs. Deal Keeper is owned and maintained by SuperWeb, which is well-known to security researchers for multiple identical programs, such as Fortunitas, Glamatron, Web Flipper, GoingGo, ToggleMark, etc. All these programs have their official websites and are distributed along with freeware, including media players, browser extensions, and trial versions of system optimization programs. Deal Keeper, as well as the above-mentioned programs, falls to the category of adware because it is an ad-supported program. It means that it is sponsored by third-parties, and, it is important to note that Deal Keeper is not associated with the sponsors and does not accept responsibility for their activities and privacy police. As a result, you are the only one responsible for your interaction with third-parties, and we recommend that you remove Deal Keeper from the PC. Due to the fact that Deal Keeper pay no attention to the reputation of the third-parties advertised, you risk your privacy every time you click on a Deal Keeper advertisement. It is so because wicked webmasters may use Deal Keeper to promote their deceptive websites, and, if you want to avoid malware and spyware, you should avoid clicking on Deal Keeper ads. You should remove Deal Keeper as soon as you can because this browser plug-in collects information about your browsing behavior. It records clicks, impressions, search terms, browsing history, and other non-personally identifiable information. This type of information is collected for the purpose of providing you with targeted advertisements and enhancing the quality of the service, but you can prevent this by removing the adware program from the computer. Below you will find our step-by-step instructions on how to uninstall Deal Keeper and any other program that has its uninstaller. However, we recommend that you implement SpyHunter because this real-time security tool can remove Deal Keeper and shield the system against multiple Internet-based threats, including Trojan horses, ransomware infections, browser hijackers, and many other threats. Once you remove the Deal Keeper adware program, you should install a reputable scanner so that you can be sure that no malicious files or programs are present on the computer. Quick & tested solution for Deal Keeper removal. 10x this was very helpfull. I "uninstalled" using the control panel but it is not gone. Now what?? After I clicked uninstall it said I do not have authority to do that?!? Un installed but still not gone . Didn't work. Pop up window requires you to type in characters that are not visible.